Genspro Technologies Pte Ltd was an established firm specializing in Security System since 5 August 2008. The company was transform from a partnership company (Genesis Security And Services Pte Ltd) which incorporated since 1997 by the same founder. The transformation let Genspro Technologies Pte Ltd can offer more comprehensive range of security products, Research, Development, Solution and Integration on new product for various market ranging from residential, commercial, industrial and high security facilities. Genspro’s mission is to provide a Total Customers Satisfaction through Prominent Quality Products and Services. And we commit ourselves to address promptly our customers?need and concerns through cost effective solution and value added services. The company is leading by a team of experienced and well trained technical personnel. As the daily changing and improving in technologies, we had upgrade & improved our skills and knowledge to ensure that our customers receive a quality of service that continues to build our reputation. 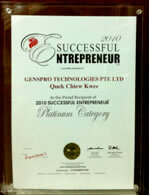 Through continuous hard work and commitment, Genspro Technologies Pte Ltd was presented with the ?010 Successful Entrepreneur?by the GRC Press Holdings, Singapore. Genspro Technologies Pte Ltd has continues looking forward to achieve and develop more new technology and good service to serves our value-customer. Protection of our client and their properties is our utmost priority and this can be achieved by providing an efficient and reliable security services. We continually strive to upgrade and improve our services to our clients. Our affiliations with international companies within the same industry keep us informed and aware of the development in the security industry. Our commitment to our employees is to provide an environment that promotes self ?development and opportunities for career advancement.